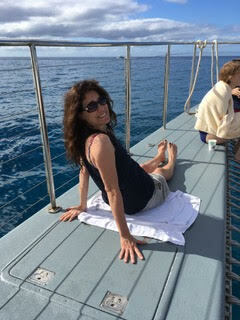 I must tell you-- and it's not to make anyone jealous-- but I spent the beginning of the new year in Hawaii. When I flew out of Chicago it was -3 degrees. When I arrived in Hawaii 13 hours later (due to layovers) it was 82 degrees. My body adjusted to an 85 degree difference without a problem. Even better, the weather remained in the upper 70s and lower 80s for six glorious days of paradise. My trip to Hawaii was a gift. Yep! Believe it or not, my niece received a trip to Hawaii for her birthday and she was given an opportunity to invite a friend. Well, guess who she chose? ME! Pretty sweet deal! So maybe that's why I'm bragging. Again, not to make you jealous. Rather, it's because I feel like the luckiest person in the world to have been asked. I wouldn't have cared if it was a trip to Antarctica (which by the way, was only a few degrees colder than Chicago at the time of my departure to Hawaii), I was along for the ride with family. Okay, back to the tropics: My sister's family and I spent every day at the beach. 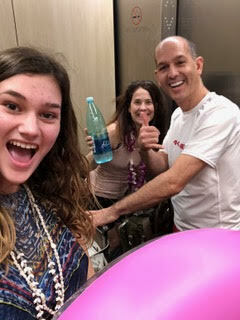 My niece and I didn't waste any time getting atop paddle boards, drifting on inner tubes, eating nachos, and salted pretzels, and sucking down tropical pina coladas. Away from the beach, we took a couple side trips. A major highlight was spotting a humpback whale and dolphins. We had front row seats at a Luau and snorkeled in the Pacific with sea turtles and fish of incredible colors. And then, sadly, the return. I left Hawaii at 4 pm on January 8. The weather was 81 degrees. I arrived at O'Hare the next morning, after a very turbulent plane ride. The weather was 2 degrees. Again, my body adjusted to a 80 degree difference in temperature, but unlike a week earlier, where I seemed to have no problem going from cold to warm, my return did not fare the same. I shook and shivered for three days straight, and not from flu symptoms. I simply couldn't get use to the frigid temperatures. Well, a week home now, and I'm once again used to the cold. And don't think I'm crazy, but when I heard snow in the forecast... I had a feeling of excitement. The tropics are glorious, but snow... it just has that warm feeling of home.